The legend has it that there lived a dragon god in a deep pool named “Wan-kase-buchi (Bowl Lending Pool)” in the Hida River near the village. Whenever the villagers needed expensive bowls and plates for a cerebration banquet, they went to the pool and asked the dragon god to lend some. However, one villager did not return one of the borrowed bowls and kept it for himself, at which the dragon god was angry and got on a rampage until finally he got it back. 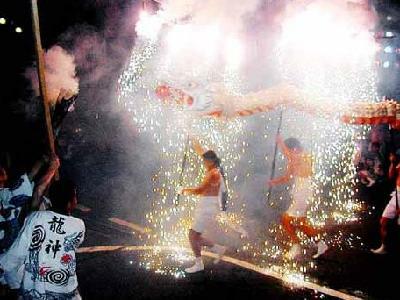 During the [Ryujin Fire] Festival, reenacting the rampage of the dragon god, the men controlling five dragons, each of which is 20 m in length and weighs 250 kg, perform valiant dances, chasing after the mikoshi carrying a big bowl. The scene of the dragons belching fire from fireworks set in the mouths in the midst of big sounds of drums and gongs and sparks of handheld fireworks is really dynamic. Ryujin (Dragon God) Fire Festival is held on the first day of Gero Onsen Festival, which is held for three days from the first Saturday in August in a famous hot spring town of Gero in Gifu Prefecture.